Having missed the last several Marvel Studios releases, I was lost for most of this third Avengers feature, which brings together story lines from multiple franchises. 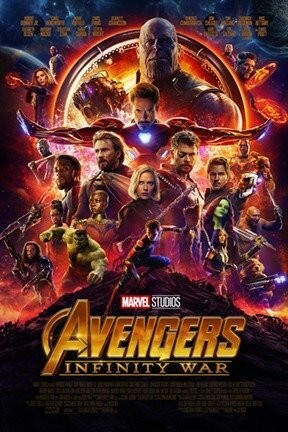 Dozens of superheroes try to stop an evil space alien from stealing six magic stones that control the forces of existence, and though fans may enjoy seeing all the different narratives intertwine (Thor rides with the Guardians of the Galaxy, Iron Man fights alongside Doctor Strange, etc), there's little here for the uninitiated. With so many characters to cover, directors Anthony and Joe Russo have no time to develop any of them, and the action set pieces are all by the numbers. Avengers: Infinity War and Avengers: Infinity War 3D are not showing in any theaters in the area.